Anyway, this envelope wasn't from a publisher; it was from Steven Self. You may think of Steven as a great knitter, but I've known him since before knitting (I think), since he is also a health sciences librarian. I wasn't expecting anything from Steven, but we belong to a couple of the same associations, I just assumed to was something work-related. 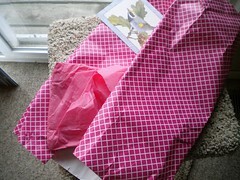 Imagine my surprise when I opened the envelope and pulled out a package wrapped in two kinds of pink paper. but here's what's left of it, posing on the cat perch. Steven blogged about knitting these here and here and here. And he even blogged about having someone in mind to give them to. Possibly because I have neither dainty hands nor a January birthday, it didn't even occur that that person might be me! While I was sitting in my office with these gorgeous mittens on my hands, it occurred to me that I have never received a knitted gift from anyone except my grandma. and a fellow knitter will enjoy them the most! He knows you well...pink paper and all! Steven would make an AWESOME grandma. 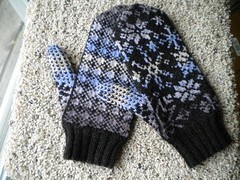 The mittens are perfect and you will love them appropriately! Lucky duck. Nice mittens. They would come in handy for the 14" of snow we just got! I have only received a knitted gift once (since adulthood anyway) a friend knit me some socks, and I love them. Lucky duck, indeed. They're beautiful! I love the mittens, they are really wonderful. I have been reading your blog for quite a long time and just now noticed that you have the same first name as my daughter.